The Hampton Court Palace Flower Show opens today in London, exhibiting an amazing 47 show gardens and over 500 horticultural stands. You’d be right in guessing that this is the largest garden show in the world. Although also run by the Royal Horticultural Society, unlike Chelsea, it has a very relaxed feel to it and visitors are actively encouraged to get in amongst the plants in many of the gardens. Covering a staggering 34 acres, it’s a little hard to know where to start in attempting to summarise all that the show has to offer. Perhaps a brief description of the 15 gold medal-winning gardens is as good a place as any. This garden celebrates the 125th year of The Dogs Trust, a charity for abandoned dogs, with a habitat designed to be harmoniously shared between dogs and their owners. Sniffer tracks have been weaved through the herbaceous borders and lively sculptures capture the essence of dog behaviour. The rectilinear structure of the garden doesn’t hugely excite but the planting, in colours dogs most easily see, lives up to the experience of the talented designer. With warm, summer, flower colours, Catherine’s garden for Squires Garden Centres seeks to break up a perfectly rectangular garden into sections for entertaining, relaxing, production and utility. The diagonal axis certainly helps delineate a sequence of intimate spaces and the planting is beautiful, if a little highly seasonal. I would love to see the fences a little more ‘greened up’ but the large trees help provide maturity. An excellent execution of a typical Hampton Court show garden: perhaps a little predictable but the type of garden that many could envisage, and indeed would love to have, at home. This garden symbolises the journeys of life, in particular those of children living in places of poverty and disaster, whom the charity, World Vision, support. Whilst the garden is beautifully executed, it is exactly the same concept as the Chelsea World Vision garden, which put me off a little and I feel it would belong much more appropriately in the Conceptual Garden category. I guess the sponsors feel that a Show Garden is higher profile, but this garden is a statement, entirely unpractical as a real garden (many people at Chelsea commented on the difficulty of mowing!) and I feel it fails where it sits, but would be a stand out elsewhere. This garden reflects the Yorkshire countryside of the home of its fragrant disinfectants sponsor. A stream and open fields lead (perhaps not entirely seamlessly) to the more cultivated garden shown above. The colours have been chosen to complement the buff Yorkshire stone and I like the overall, very cheery effect of this combination. This garden by the overall show sponsor is designed to evoke the traditional Scandinavian way of life, ‘where comfort and beauty is drawn from the simplest things’. I’d seen a stunning concept drawing and read about its naturalistic planting and everything said I should adore this garden. But, sadly, it didn’t quite move me as it might; I find the planting a little stuck between natural and cultivated, bringing benefits of neither particularly clearly. Obviously the judges disagreed, perhaps you do too? In my view, deservedly winning the Best Show Garden (across the Show, Water and World Garden categories) was the Wildfowl and Wetland Trust garden, promoting the use of water runoff in inspiring ways. I thought the planting, gravel and timber landscaping were absolutely beautiful and I loved the simple but effective colour scheme of this native English garden. Probably my favourite of the whole show and the winner of Best Summer Garden was this foliage-dominated, contemporary garden, led by designer Andrew Fisher Tomlin. The messages around plants, hydration and youth aim to raise awareness of Crohn’s disease in young people and inspire the adoption of gardening at an earlier age. Using unusual plants, but ones that can survive in an sheltered, urban, English garden, the result is a cosy, intimate and captivating display. Many Australian plants, including Plectranthus, Acacia, Westringia, Dodonaea, Cyathea and Dicksonia, alongside New Zealand’s intriguing Pseudopanax and Muehlenbeckia, form this highly appealing, modern garden; I think it’s absolutely fabulous! Inspired by the ethos of the Arts and Crafts movement, this garden ’embraces the values of simplicity, elegance, style and craftsmanship’. The concept design describes the ‘voluptuous abundance of nature’ in the garden, and whilst I like the garden, the narrow borders prevent a feeling of ‘abundance’ for me, and with it, some of its potential. I also find it just a little too busy, with so many different materials used. Yet, undoubtably English and pretty. Designed to celebrate the diversity of lavender, this garden was inspired by the vision of lavenders growing at a dairy farm in the South Downs National Park. It certainly smelt gorgeous, even walking past, but did it really celebrate the diversity of lavender? Perhaps I have been spoilt, living and growing so many types of lavender in different parts of the world, but this did feel a little too ‘monocropped’ for me. I liked the sunken seating area but just craved a little more variety in the planting. I’ve never been entirely convinced about the merits of conceptual gardens: gardens designed to raise the profile of an issue, as opposed to being valued purely for their aesthetics, productive or amenity value. But having spoken to many of the conceptual garden designers yesterday, I realise I have been far too blinkered. Whilst it’s not the area of design that personally excites me most, it seems to be a great mechanism for helping people be heard and really harnesses amazing creativity: shouldn’t we embrace any form of garden that brings benefits? Dark stone footprints depict the world’s heavy carbon use and a vortex of black ‘oil’ drains away from the central bowl in a dramatic, high energy, swirling motion. 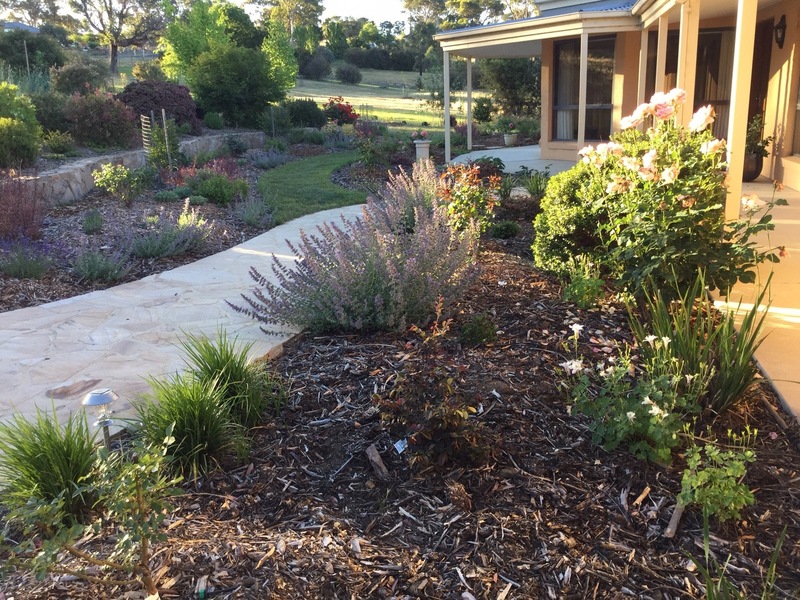 The planting, which has a somewhat Australian feel to it, shows the need for drought and heat tolerant plants as climate change progresses and sculptured hazel trees represent nature’s powerful elements: the sun, wind and water. Arit has created quite a contrast of beauty and despair with vibrant, healthy plants juxtaposed with aspects of quite sinister hard landscaping. Amanda highlights the isolation and inner suffering that people with depression experience, in a dark island surrounded by a ‘brave’ covering of lush plants, which also represent friends and family trying to cross the water to help. Planting on the island illustrates the struggle to keep up appearances whilst hiding the ‘demons and darkness’ within. A extremely clear visual message for all of us to understand as best we can, and support those experiencing, this distressingly common condition. Robert’s garden is inspired by an ancient Chinese myth – the Red Thread of Fate – that states the gods tie our ankles with red thread when we are born, attaching it to all the people whose lives we’re destined to touch. Asian plants with hints of red and burgundy complement the design and visitors are invited to tie red thread around the posts or take some home with them, such that the concept leaves a mark on the visitor and vice versa. WHY? communicates the complexity of the universe and of the human brain in a garden containing 1.5 million individual grass plants, 300 tons of imported soil and a seemingly chaotic structure of black rods that combined, create a perfect dome. Inside the dome is another miniature version of above, representing the internal and external complexity of the brain and the universe. The simplicity and precise nature of this garden is very striking. Almost impossible to photograph – but with huge impact whilst standing in the middle – the safe wooden shelter, surrounded by lush planting represents safety for refugees, beyond the moat and barbed-wire fence bordering a land of struggling plants set in rubble, with the occasional abandoned teddy bear. Inspired by the Syrian refugee crisis last year, Massey and Ward told me they wanted people to consider their thoughts on this situation. The inner planting was so entirely beautiful and the outer so authentically struggling, the stark contrast couldn’t help but stimulate a reflective moment for visitors to the Best Conceptual Garden. Serpentine landforms developed by Victoria provide a contemporary homage to the grand landscape designs of Capability Brown, who was Head Gardener at Hampton Court Palace from 1764 until his death in 1783. A turf bench, cut into the left hand mound provides a seat for contemplation. A clever interpretation, given the difficulty of translating such a large estate concept into a small show garden, but perhaps not one to hold my attention indefinitely. When you talk to gardeners – professional designers and hobbyists, alike – most show-goers will state a strong preference for either Chelsea or Hampton Court over the other. Yet perhaps we shouldn’t try to compare these two very different events. I confess that the absolute pinnacle of design, displayed at Chelsea, is a huge drawcard for me and yet there is so much more, so much variety and so many translatable ideas on offer at Hampton Court. There’s only one thing for it: I’ll just have to keep testing the two and visit both for the foreseeable future! 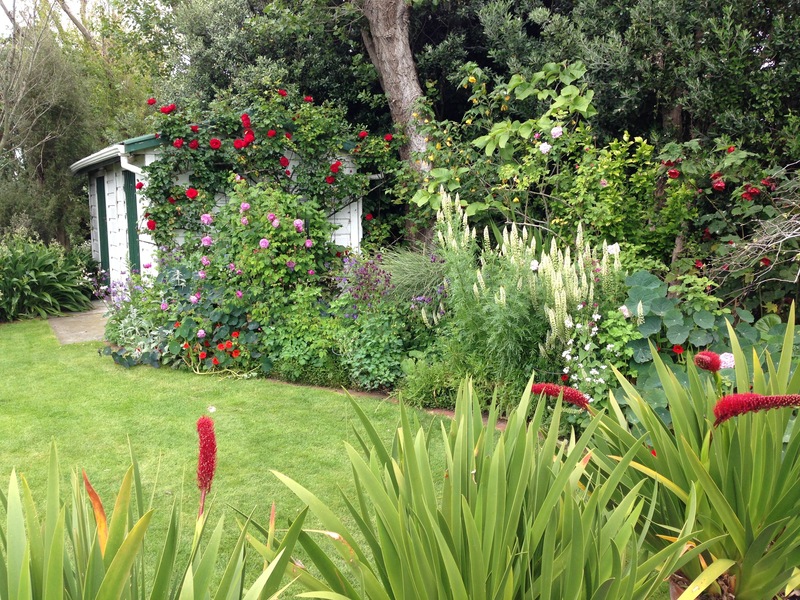 I love the blues in the Dog’s Garden, and my favourite garden was The Bowel Disease garden, and the summer retreat. It is fun looking at the gardens to get a bit of inspiration from all of them….especially on a somewhat dreary Canberra day. Thanks for the post Janna. I do remember those cold, July mornings in Canberra. But also how clear the skies were for most of the winter; I hope that dreariness was a one off. Hard to get my head around the back-to-front-ness of our seasons again, but it is nice that we both have somewhere to find inspiration when we’re at our bleakest. I’ll certainly be looking forward to seeing your photos once December rolls around! It is lovely to see out of season photos…..a good reminder of what is to come! Enjoy your English summer. Thanks very much. Summers are all a bit short over here so I intend to try and make the most of it! I must remind myself that changing seasons are one of life’s pleasures. Thanks for such a comprehensive and thoughtful review of the show gardens, Janna. The idea of ‘sniffer tracks’ through herbaceous borders has made me laugh, I go to great lengths to keep my two furry tanks out of the soft planting. The one that stands out for me is the Bowel Disease garden – great structure and fab planting. Glad it’s not just the Aussies who like the Bowel Disease garden! I think the intimacy is part of what appeals to me most. It’s rare to get it in quite this way in a show garden. And yes, I did wonder whether the soft planting would really withstand a playful dog’s energy. They had a very well-behaved, small terrier on a lead (apparently the first dog to get a press pass to the flower show!) but I’m not sure that was really a fair test! Thanks Janna, great description and depiction of what looks to gave been a great show. From the pictures I agree with your choice of favourite…but then perhaps I am just supporting the ‘Australian’ contingent in the planting choices. Or maybe I spent longer there than at any other garden and hence took the time to get a really good photo of it! Who knows? But either way, there were lots of great gardens and ideas and it was really good to see such variety. You don’t normally get to see quite so much in one visit! What is the ’orange’ flowered grass plant at the front do you know Janna? I just can’t place it for some reason and would love to use it myself. All these gardens (unlike some Chelsea ones) are very ‘doable’ in the home garden. This seems like my type of show! Thanks Janna and I hope all is well there for you and Paul. It’s interesting that the conceptual gardens haven’t been mentioned by anyone so far. I wanted to include them to see whether others thought differently to me; after all, there were lots of gold medals in that category. But (secretly) it’s nice that others seem to be touched, mostly, by the same ones as me! I think the ‘orange’ flowered grass is Elegia equisetacea, another southern hemisphere plant. I hope you can get hold of some. I think you’d be in your element at this show, although it would be sad for you to see all the plants for sale and not be able to take them home with you. But worth planning a Europe trip to co-incide with it, I think. Chelsea is way too early for every other garden in the UK. And all well with us both; thanks very much for asking! Hope you are keeping warm over there. Wow! I hadn’t heard of this (showing my ignorance) looks like an awesome event to experience. Another one for my itinerary. I loved the more relaxed feel of these gardens. In particular, a dog’s life and bowel disease gardens. Thanks for opening my eyes with a little snap shot of more gardens to visit in the coming years. Hampton Court certainly hasn’t got the name of Chelsea, but it seems to be getting bigger and better each year (this is now it’s 26th year). There’s a lot going for it, including more elbow room and the ease with which you can pick up a ticket, so I’m glad you’ve made a mental note for your growing list. I’m also extremely excited that you liked the Australian plants one!! Once again a great overview and insight into a show garden event. Thank you Janna. Hampton Court will have to be included on my next trip Janna as it looks like there are great gardens to see! Thanks Steven. You would be in your absolute element at Hampton Court! Looking forward to seeing you in London again soon!